Argatroban is a synthetic direct thrombin inhibitor derived from L-arginine. The chemical name for Argatroban is 1-[5-[(aminoiminomethyl)amino]-1-oxo-2-[[(1,2,3,4-tetrahy-dro-3-methyl-8-quinolinyl)sulfonyl]amino]pentyl]-4-methyl-2-piperidinecarboxylic acid, monohydrate. Argatroban has 4 asymmetric carbons. One of the asymmetric carbons has an R configuration (stereoisomer Type I) and an S configuration (stereoisomer Type II). Argatroban consists of a mixture of R and S stereoisomers at a ratio of approximately 65:35. The molecular formula of Argatroban is C 23 H 36 N 6 O 5 S·H 2 O. Its molecular weight is 526.66. Argatroban is a white, odorless crystalline powder that is freely soluble in glacial acetic acid, slightly soluble in ethanol, and insoluble in acetone, ethyl acetate, and ether. Argatroban Injection is a sterile clear, colorless to pale yellow, slightly viscous solution. Argatroban is available in 250-mg (in 2.5-mL) single-use amber vials, with gray flip-top caps. Each mL of sterile, nonpyrogenic solution contains 100 mg Argatroban. Inert ingredients: 750 mg D-sorbitol, 1,000 mg dehydrated alcohol. Mechanism of Action: Argatroban is a direct thrombin inhibitor that reversibly binds to the thrombin active site. Argatroban does not require the co-factor antithrombin III for antithrombotic activity. Argatroban exerts its anticoagulant effects by inhibiting thrombin-catalyzed or -induced reactions, including fibrin formation; activation of coagulation factors V, VIII, and XIII; activation of protein C; and platelet aggregation. Argatroban is highly selective for thrombin with an inhibitory constant (K i ) of 0.04 µM. At therapeutic concentrations, Argatroban has little or no effect on related serine proteases (trypsin, factor Xa, plasmin, and kallikrein). Argatroban is capable of inhibiting the action of both free and clot-associated thrombin. Argatroban does not interact with heparin-induced antibodies. Evaluation of sera in 12 healthy subjects and 8 patients who received multiple doses of Argatroban did not reveal antibody formation to Argatroban (see CLINICAL STUDIES ). Pharmacokinetics: Distribution: Argatroban distributes mainly in the extracellular fluid as evidenced by an apparent steady-state volume of distribution of 174 mL/kg (12.18 L in a 70-kg adult). Argatroban is 54% bound to human serum proteins, with binding to albumin and (alpha) 1 -acid glycoprotein being 20% and 34%, respectively. Metabolism: The main route of Argatroban metabolism is hydroxylation and aromatization of the 3-methyltetrahydroquinoline ring in the liver. The formation of each of the 4 known metabolites is catalyzed in vitro by the human liver microsomal cytochrome P450 enzymes CYP3A4/5. The primary metabolite (M1) exerts 3- to 5-fold weaker anticoagulant effects than Argatroban. Unchanged Argatroban is the major component in plasma. The plasma concentrations of M1 range between 0% and 20% of that of the parent drug. The other metabolites (M2 to M4) are found only in very low quantities in the urine and have not been detected in plasma or feces. These data, together with the lack of effect of erythromycin (a potent CYP3A4/5 inhibitor) on Argatroban pharmacokinetics, suggest that CYP3A4/5-mediated metabolism is not an important elimination pathway in vivo. Total body clearance is approximately 5.1 mL/kg/min (0.31 L/kg/hr) for infusion doses up to 40 mcg/kg/min. The terminal elimination half-life of Argatroban ranges between 39 and 51 minutes. There is no interconversion of the 21-(R):21-(S) diastereoisomers. The plasma ratio of these diastereoisomers is unchanged by metabolism or hepatic impairment, remaining constant at 65:35 (± 2%). Excretion: Argatroban is excreted primarily in the feces, presumably through biliary secretion. In a study in which 14 C-Argatroban (5 mcg/kg/min) was infused for 4 hours into healthy subjects, approximately 65% of the radioactivity was recovered in the feces within 6 days of the start of infusion with little or no radioactivity subsequently detected. Approximately 22% of the radioactivity appeared in the urine within 12 hours of the start of infusion. Little or no additional urinary radioactivity was subsequently detected. Average percent recovery of unchanged drug, relative to total dose, was 16% in urine and at least 14% in feces. Pharmacokinetic/Pharmacodynamic Relationship: When Argatroban is administered by continuous infusion, anticoagulant effects and plasma concentrations of Argatroban follow similar, predictable temporal response profiles, with low intersubject variability. Immediately upon initiation of Argatroban infusion, anticoagulant effects are produced as plasma Argatroban concentrations begin to rise. Steady-state levels of both drug and anticoagulant effect are typically attained within 1 to 3 hours and are maintained until the infusion is discontinued or the dosage adjusted. Steady-state plasma Argatroban concentrations increase proportionally with dose (for infusion doses up to 40 mcg/kg/min in healthy subjects) and are well correlated with steady-state anticoagulant effects. For infusion doses up to 40 mcg/kg/min, Argatroban increases in a dose-dependent fashion, the activated partial thromboplastin time (aPTT), the activated clotting time (ACT), the prothrombin time (PT), the International Normalized Ratio (INR), and the thrombin time (TT) in healthy volunteers and cardiac patients. 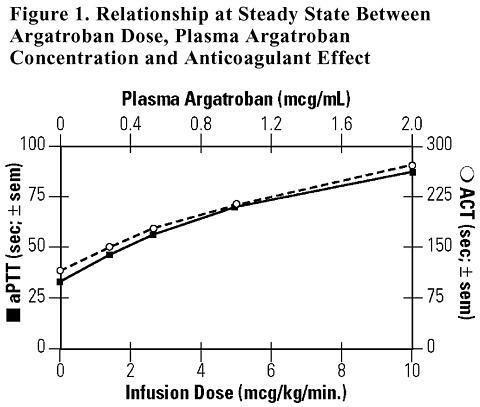 Representative steady-state plasma Argatroban concentrations and anticoagulant effects are shown below for Argatroban infusion doses up to 10 mcg/kg/min (see Figure 1). Effect on International Normalized Ratio (INR): Because Argatroban is a direct thrombin inhibitor, co-administration of Argatroban and warfarin produces a combined effect on the laboratory measurement of the INR. However, concurrent therapy, compared to warfarin monotherapy, exerts no additional effect on vitamin K-dependent factor Xa activity. The relationship between INR on co-therapy and warfarin alone is dependent on both the dose of Argatroban and the thromboplastin reagent used. This relationship is influenced by the International Sensitivity Index (ISI) of the thromboplastin. Data for 2 commonly utilized thromboplastins with ISI values of 0.88 (Innovin, Dade) and 1.78 (Thromboplastin C Plus, Dade) are presented in Figure 2 for an Argatroban dose of 2 mcg/kg/min. Thromboplastins with higher ISI values than shown result in higher INRs on combined therapy of warfarin and Argatroban. These data are based on results obtained in normal individuals (see PRECAUTIONS , Drug Interactions and DOSAGE AND ADMINISTRATION , Conversion to Oral Anticoagulant Therapy ). Figure 2 demonstrates the relationship between INR for warfarin alone and INR for warfarin co-administered with Argatroban at a dose of 2 mcg/kg/min. To calculate INR for warfarin alone (INR W ), based on INR for co-therapy of warfarin and Argatroban (INR WA ), when the Argatroban dose is 2 mcg/kg/min, use the equation next to the appropriate curve. Example: At a dose of 2 mcg/kg/min and an INR performed with Thromboplastin A, the equation 0.19 + 0.57 (INR WA ) = INR W would allow a prediction of the INR on warfarin alone (INR W ). Thus, using an INR WA value of 4.0 obtained on combined therapy: INR W = 0.19 + 0.57 (4) = 2.47 as the value for INR on warfarin alone. The error (confidence interval) associated with a prediction is ± 0.4 units. Similar linear relationships and prediction errors exist for Argatroban at a dose of 1 mcg/kg/min. Thus, for Argatroban doses of 1 or 2 mcg/kg/min, INR W can be predicted from INR WA . For Argatroban doses greater than 2 mcg/kg/min, the error associated with predicting INR W from INR WA is ± 1. Thus, INR W cannot be reliably predicted from INR WA at doses greater than 2 mcg/kg/min. Renal Impairment: No dosage adjustment is necessary in patients with renal dysfunction. The effect of renal disease on the pharmacokinetics of Argatroban was studied in 6 subjects with normal renal function (mean Clcr = 95 ± 16 mL/min) and in 18 subjects with mild (mean Clcr = 64 ± 10 mL/min), moderate (mean Clcr = 41 ± 5.8 mL/min), and severe (mean Clcr = 5 ± 7 mL/min) renal impairment. The pharmacokinetics and pharmacodynamics of Argatroban at dosages up to 5 mcg/kg/min were not significantly affected by renal dysfunction. Use of Argatroban was evaluated in a study of 12 patients with stable end-stage renal disease undergoing chronic intermittent hemodialysis. Argatroban was administered at a rate of 2 to 3 mcg/kg/min (begun at least 4 hours prior to dialysis) or as a bolus dose of 250 mcg/kg at the start of dialysis followed by a continuous infusion of 2 mcg/kg/min. Although these regimens did not achieve the goal of maintaining ACT values at 1.8 times the baseline value throughout most of the hemodialysis period, the hemodialysis sessions were successfully completed with both of these regimens. The mean ACTs produced this study ranged from 1.39 to 1.82 times baseline, and the mean aPTTs ranged from 1.96 to 3.4 times baseline. When Argatroban was administered as a continuous infusion of 2 mcg/kg/min prior to and during a 4-hour hemodialysis session, approximately 20% was cleared through dialysis. Hepatic Impairment: The dosage of Argatroban should be decreased in patients with hepatic impairment (see PRECAUTIONS and DOSAGE AND ADMINISTRATION ). Patients with hepatic impairment were not studied in percutaneous coronary intervention (PCI) trials. At a dose of 2.5 mcg/kg/min, hepatic impairment is associated with decreased clearance and increased elimination half-life of Argatroban (to 1.9 mL/kg/min and 181 minutes, respectively, for patients with a Child-Pugh score >6). Age, Gender: There are no clinically significant effects of age or gender on the pharmacokinetics or pharmacodynamics (e.g., aPTT) of Argatroban. Drug-Drug Interactions: Digoxin: In 12 healthy volunteers, intravenous infusion of Argatroban (2 mcg/kg/min) over 5 days (study days 11 to 15) did not affect the steady-state pharmacokinetics of oral digoxin (0.375 mg daily for 15 days). Erythromycin: In 10 healthy subjects, orally administered erythromycin (a potent inhibitor of CYP3A4/5) at 500 mg four times daily for 7 days had no effect on the pharmacokinetics of Argatroban at a dose of 1 mcg/kg/min for 5 hours. These data suggest oxidative metabolism by CYP3A4/5 is not an important elimination pathway in vivo for Argatroban. Heparin-Induced Thrombocytopenia: Heparin-induced thrombocytopenia (HIT) is a potentially serious, immune-mediated complication of heparin therapy that is strongly associated with subsequent venous and arterial thrombosis. Whereas initial treatment of HIT is to discontinue administration of all heparin, patients may require anticoagulation for prevention and treatment of thromboembolic events. The conclusion that Argatroban is an effective treatment for heparin-induced thrombocytopenia (HIT) and heparin-induced thrombocytopenia and thrombosis syndrome (HITTS) is based upon the data from an historically controlled efficacy and safety study (Study 1) and a follow-on efficacy and safety study (Study 2). These studies were comparable with regard to study design, study objectives, dosing regimens as well as study outline, conduct, and monitoring. In these studies, 568 adult patients were treated with Argatroban and 193 adult patients made up the historical control group. Patients were required to have a clinical diagnosis of heparin-induced thrombocytopenia, either without thrombosis (HIT) or with thrombosis (HITTS) and be males or non-pregnant females between the age of 18 and 80 years old. HIT/HITTS was defined by a fall in platelet count to less than 100,000/µL or a 50% decrease in platelets after the initiation of heparin therapy with no apparent explanation other than HIT. Patients with HITTS also had presence of an arterial or venous thrombosis documented by appropriate imaging techniques or supported by clinical evidence such as acute myocardial infarction, stroke, pulmonary embolism, or other clinical indications of vascular occlusion. Patients who required anticoagulation with documented histories of positive HIT antibody test were also eligible in the absence of thrombocytopenia or heparin challenge (e.g., patients with latent disease). Patients with documented unexplained aPTT >200% of control at baseline, documented coagulation disorder or bleeding diathesis unrelated to HITTS, a lumbar puncture within the past 7 days or a history of previous aneurysm, hemorrhagic stroke, or recent thrombotic stroke, within the past 6 months, unrelated to HITTS were excluded from these studies. The primary efficacy analysis was based on a comparison of event rates for a composite endpoint that included death (all causes), amputation (all causes) or new thrombosis during the treatment and follow-up period (study days 0 to 37). Secondary analyses included evaluation of the event rates for the components of the composite endpoint as well as time-to-event analyses. In Study 1, 304 patients were enrolled having active HIT (129/304, 42%), active HITTS (144/304, 47%), or latent disease (31/304, 10%). Among the 193 historical controls, 139 (72%) had active HIT, 46 (24%) had active HITTS, and 8 (4%) had latent disease. Within each group, those with active HIT and those with latent disease were analyzed together. Positive laboratory confirmation of HIT/HITTS by the heparin-induced platelet aggregation test or serotonin release assay was demonstrated in 174 of 304 (57%) Argatroban-treated patients (i.e., in 80 with HIT or latent disease and 94 with HITTS) and in 149 of 193 (77%) historical controls (i.e., in 119 with HIT or latent disease and 30 with HITTS). The test results for the remainder of the patients and controls were either negative or not determined. A categorical analysis showed a significant improvement in the composite outcome in patients with HIT and HITTS treated with Argatroban versus those in the historical control group (see Table 1). The components of the composite endpoint are shown in Table 2. *Death (all causes), amputation (all causes), or new thrombosis within 37-day study period. *Reported as the most severe outcome among the components of composite endpoint (severity ranking: death > amputation > new thrombosis); patients may have had multiple outcomes. 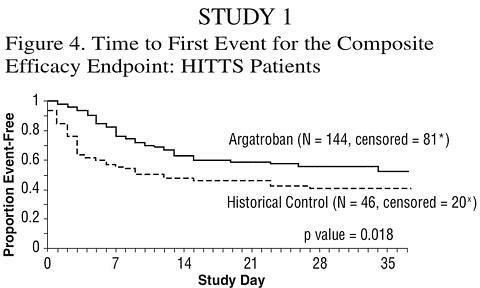 Time-to-event analyses showed significant improvements in the time-to-first event in patients with HIT or HITTS treated with Argatroban versus those in the historical control group. The between-group differences in the proportion of patients who remained free of death, amputation, or new thrombosis were statistically significant in favor of Argatroban by these analyses (p = 0.007 in patients with HIT and p = 0.018 in patients with HITTS, according to log-rank test). A time-to-event analysis for the composite endpoint is shown in Figure 3 for patients with HIT and Figure 4 for patients with HITTS. *Censored indicates no clinical endpoint (defined as death, amputation, or new thrombosis) was observed during the follow-up period (maximum period of follow-up was 37 days). In Study 2, 264 patients were enrolled, having either HIT (125/264, 47.3%) or HITTS (139/264, 52.7%), and then treated with Argatroban. Categorical analysis demonstrated significant improvement in the composite efficacy outcome for Argatroban-treated patients, versus the same historical control group from Study 1, among patients having HIT (25.6% vs. 38.8%), patients having HITTS (41.0% vs. 56.5%), and patients having either HIT or HITTS (33.7% vs. 43.0%). 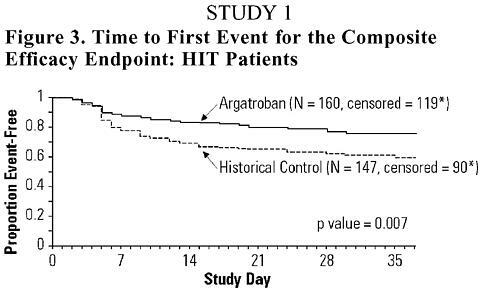 Time-to-event analyses showed significant improvements in the time-to-first event in patients with HIT or HITTS treated with Argatroban versus those in the historical control group. The between-group differences in the proportion of patients who remained free of death, amputation, or new thrombosis were statistically significant in favor of Argatroban. Anticoagulant Effect: In Study 1, the mean (± SE) dose of Argatroban administered was 2.0 ± 0.1 mcg/kg/min in the HIT arm and 1.9 ± 0.1 mcg/kg/min in the HITTS arm. Seventy-six percent of patients with HIT and 81% of patients with HITTS achieved a target aPTT at least 1.5-fold greater than the baseline aPTT at the first assessment occurring on average at 4.6 hours (HIT) and 3.9 hours (HITTS) following initiation of Argatroban therapy. No enhancement of aPTT response was observed in subjects receiving repeated administration of Argatroban. Platelet Count Recovery: In Study 1, the majority of patients, 53% of those with HIT and 58% of those with HITTS, had a recovery of platelet count by day 3. Platelet Count Recovery was defined as an increase in platelet count to >100,000/µL or to at least 1.5-fold greater than the baseline count (platelet count at study initiation) by day 3 of the study. Percutaneous Coronary Intervention (PCI) in HIT/HITTS Patients: In 3 similarly designed trials, Argatroban was administered to 91 patients with current or previous clinical diagnosis of HIT/HITTS or heparin-dependent antibodies, who underwent a total of 112 percutaneous coronary interventions (PCIs) including percutaneous transluminal coronary angioplasty (PTCA), coronary stent placement, or atherectomy. Among the 91 patients undergoing their first PCI with Argatroban, notable ongoing or recent medical history included myocardial infarction (n = 35), unstable angina (n = 23), and chronic angina (n = 34). There were 33 females and 58 males. The average age was 67.6 years (median 70.7, range 44 to 86), and the average weight was 82.5 kg (median 81.0 kg, range 49 to 141). Due to the history or presence of the heparin-dependent antibody or HIT/HITTS, these patients required alternative anticoagulation. Twenty-one of the 91 patients had a repeat PCI using Argatroban an average of 150 days after their initial PCI. Seven of 91 patients received glycoprotein IIb/IIIa inhibitors. Safety and efficacy were assessed against historical control populations. Per protocol, all patients received oral aspirin (325 mg) 2 to 24 hours prior to the interventional procedure. After venous or arterial sheaths were in place, anticoagulation was initiated with a bolus of Argatroban of 350 mcg/kg via a large-bore IV line or through the venous sheath over 3 to 5 minutes. Simultaneously, a maintenance infusion of 25 mcg/kg/min was initiated to achieve a therapeutic activated clotting time (ACT) of 300 to 450 seconds. If necessary to achieve this therapeutic range, the maintenance infusion dose was titrated (15 to 40 mcg/kg/min) and/or an additional bolus dose of 150 mcg/kg could be given. Each patient's ACT was checked 5 to 10 minutes following the bolus dose. The ACT was checked as clinically indicated thereafter. Arterial and venous sheaths were removed no sooner than 2 hours after discontinuation of Argatroban and when the ACT was less than 160 seconds. If a patient required anticoagulation after the procedure, Argatroban could be continued, but at a lower infusion dose between 2.5 and 5 mcg/kg/min. An aPTT was drawn 2 hours after this dose reduction and the dose of Argatroban then adjusted as clinically indicated (not to exceed 10 mcg/kg/min), to reach an aPTT between 1.5 and 3 times baseline value (not to exceed 100 seconds). Ninety-one patients were treated with Argatroban on their first PCI, and 21 patients were reexposed to Argatroban on subsequent PCIs. In 92 of the 112 interventions (82%), the patient received the initial bolus of 350 mcg/kg and an initial infusion dose of 25 mcg/kg/min. The majority of patients did not require additional bolus dosing during the PCI procedure. The mean value for the initial ACT measurement after the start of dosing for all interventions was 379 sec (median 338 sec; 5 th percentile-95 th percentile 238 to 675 sec). The mean ACT value per intervention over all measurements taken during the procedure was 416 sec (median 390 sec; 5 th percentile-95 th percentile 261 to 698 sec). About 65% of patients had ACTs within the recommended range of 300 to 450 seconds throughout the procedure. The investigators did not achieve anticoagulation within the recommended range in about 23% of patients. However, in this small sample, patients with ACTs below 300 seconds did not have more coronary thrombotic events, and patients with ACTs over 450 seconds did not have higher bleeding rates. Acute procedural success was defined as lack of death, emergent coronary artery bypass graft (CABG), or Q-wave myocardial infarction. Acute procedural success was reported in 98.2% of patients who underwent PCIs with Argatroban anticoagulation compared with 94.3% of historical control patients anticoagulated with heparin (p = NS). Among the 112 interventions, 2 patients had emergency CABGs, 3 had repeat PTCAs, 4 had non-Q-wave myocardial infarctions, 3 had myocardial ischemia, 1 had an abrupt closure, and 1 had an impending closure (some patients may have experienced more than 1 event). No patients died. Two patients had protocol-defined major bleeding, 1 of which was retroperitoneal and the other gastrointestinal. Minor bleeding, defined as spontaneous and observed with hemoglobin decreasing >3g/dL or with no bleeding site and hemoglobin decreasing >4g/dL, occurred in 4.5% of interventions. Additional Information: Cardiac Therapy: The safety and effectiveness of Argatroban for cardiac indications outside of percutaneous coronary intervention in patients with HIT have not been established. Reexposure and Lack of Antibody Formation: Plasma from 12 healthy volunteers treated with Argatroban over 6 days showed no evidence of neutralizing antibodies. Repeated administration of Argatroban to more than 40 patients was tolerated with no loss of anticoagulant activity. No change in the dose is required. Argatroban is indicated as an anticoagulant for prophylaxis or treatment of thrombosis in patients with heparin-induced thrombocytopenia. Argatroban is indicated as an anticoagulant in patients with or at risk for heparin-induced thrombocytopenia undergoing percutaneous coronary intervention (PCI). Argatroban is contraindicated in patients with overt major bleeding, or in patients hypersensitive to this product or any of its components (see WARNINGS ). Argatroban is intended for intravenous administration. All parenteral anticoagulants should be discontinued before administration of Argatroban. Hemorrhage: Hemorrhage can occur at any site in the body in patients receiving Argatroban. An unexplained fall in hematocrit, a fall in blood pressure, or any other unexplained symptom should lead to consideration of a hemorrhagic event. Argatroban should be used with extreme caution in disease states and other circumstances in which there is an increased danger of hemorrhage. These include severe hypertension; immediately following lumbar puncture; spinal anesthesia; major surgery, especially involving the brain, spinal cord, or eye; hematologic conditions associated with increased bleeding tendencies such as congenital or acquired bleeding disorders and gastrointestinal lesions such as ulcerations. Hepatic Impairment: Caution should be exercised when administering Argatroban to patients with hepatic disease, by starting with a lower dose and carefully titrating until the desired level of anticoagulation is achieved. Also, upon cessation of Argatroban infusion in the hepatically impaired patient, full reversal of anticoagulant effects may require longer than 4 hours due to decreased clearance and increased elimination half-life of Argatroban (see DOSAGE AND ADMINISTRATION ). Use of high doses of Argatroban in PCI patients with clinically significant hepatic disease or AST/ALT levels >/=3 times the upper limit of normal should be avoided. Such patients were not studied in PCI trials. Laboratory Tests: Anticoagulation effects associated with Argatroban infusion at doses up to 40 mcg/kg/min correlate with increases of the activated partial thromboplastin time (aPTT). Although other global clot-based tests including prothrombin time (PT), the International Normalized Ratio (INR), and thrombin time (TT) are affected by Argatroban, the therapeutic ranges for these tests have not been identified for Argatroban therapy. Plasma Argatroban concentrations also correlate well with anticoagulant effects (see CLINICAL PHARMACOLOGY ). In clinical trials in PCI, the activated clotting time (ACT) was used for monitoring Argatroban anticoagulant activity during the procedure. The concomitant use of Argatroban and warfarin results in prolongation of the PT and INR beyond that produced by warfarin alone. Alternative approaches for monitoring concurrent Argatroban and warfarin therapy are described in a subsequent section (see DOSAGE AND ADMINISTRATION ). Drug Interactions: Heparin: Since heparin is contraindicated in patients with heparin-induced thrombocytopenia, the co-administration of Argatroban and heparin is unlikely for this indication. However, if Argatroban is to be initiated after cessation of heparin therapy, allow sufficient time for heparin's effect on the aPTT to decrease prior to initiation of Argatroban therapy. Aspirin/Acetaminophen: Pharmacokinetic or pharmacodynamic drug-drug interactions have not been demonstrated between Argatroban and concomitantly administered aspirin (162.5 mg orally given 26 and 2 hours prior to initiation of Argatroban 1 mcg/kg/min over 4 hours) or acetaminophen (1,000 mg orally given 12, 6, and 0 hours prior to, and 6 and 12 hours subsequent to, initiation of Argatroban 1.5 mcg/kg/min over 18 hours). Oral Anticoagulant Agents: Pharmacokinetic drug-drug interactions between Argatroban and warfarin (7.5 mg single oral dose) have not been demonstrated. However, the concomitant use of Argatroban and warfarin (5 to 7.5 mg initial oral dose, followed by 2.5 to 6 mg/day orally for 6 to 10 days) results in prolongation of the prothrombin time (PT) and International Normalized Ratio (INR) (see CLINICAL PHARMACOLOGY and DOSAGE AND ADMINISTRATION ). Thrombolytic Agents: The safety and effectiveness of Argatroban with thrombolytic agents have not been established (see ADVERSE REACTIONS , Intracranial Bleeding ). Glycoprotein IIb/IIIa Antagonists: The safety and effectiveness of Argatroban with glycoprotein IIb/IIIa antagonists have not been established. Co-Administration: Concomitant use of Argatroban with antiplatelet agents, thrombolytics, and other anticoagulants may increase the risk of bleeding (see WARNINGS ). Drug-drug interactions have not been observed between Argatroban and digoxin or erythromycin (see CLINICAL PHARMACOLOGY , Drug-Drug Interactions ). Carcinogenesis, Mutagenesis, Impairment of Fertility: No long-term studies in animals have been performed to evaluate the carcinogenic potential of Argatroban. Argatroban was not genotoxic in the Ames test, the Chinese hamster ovary cell (CHO/HGPRT) forward mutation test, the Chinese hamster lung fibroblast chromosome aberration test, the rat hepatocyte, and WI-38 human fetal lung cell unscheduled DNA synthesis (UDS) tests, or the mouse micronucleus test. Argatroban at intravenous doses up to 27 mg/kg/day (0.3 times the recommended maximum human dose based on body surface area) was found to have no effect on fertility and reproductive performance of male and female rats. Pregnancy: Teratogenic Effects: Pregnancy Category B. Teratology studies have been performed in rats with intravenous doses up to 27 mg/kg/day (0.3 times the recommended maximum human dose based on body surface area) and rabbits at intravenous doses up to 10.8 mg/kg/day (0.2 times the recommended maximum human dose based on body surface area) and have revealed no evidence of impaired fertility or harm to the fetus due to Argatroban. There are, however, no adequate and well-controlled studies in pregnant women. Because animal reproduction studies are not always predictive of human response, this drug should be used during pregnancy only if clearly needed. Nursing Mothers: Experiments in rats show that Argatroban is detected in milk. It is not known whether this drug is excreted in human milk. Because many drugs are excreted in human milk and because of the potential for serious adverse reactions in nursing infants from Argatroban, a decision should be made whether to discontinue nursing or to discontinue the drug, taking into account the importance of the drug to the mother. Geriatric Use: In the clinical studies of adult patients with HIT or HITTS, the effectiveness of Argatroban was not affected by age. Pediatric Use: The safety and effectiveness of Argatroban in patients below the age of 18 years have not been established. Adverse Events Reported in HIT/HITTS Patients: The following safety information is based on all 568 patients treated with Argatroban in Study 1 and Study 2. The safety profile of the patients from these studies is compared with that of 193 historical controls in which the adverse events were collected retrospectively. The adverse events reported in this section include all events regardless of relationship to treatment. Adverse events are separated into hemorrhagic and non-hemorrhagic events. Major bleeding was defined as bleeding that was overt and associated with a hemoglobin decrease >/=2 g/dL, that led to a transfusion of >/=2 units, or that was intracranial, retroperitoneal, or into a major prosthetic joint. Minor bleeding was overt bleeding that did not meet the criteria for major bleeding. Table 3 gives an overview of the most frequently observed hemorrhagic events, presented separately by major and minor bleeding, sorted by decreasing occurrence among Argatroban-treated HIT/HITTS patients. *Patients may have experienced more than 1 adverse event. **/* One patient experienced intracranial hemorrhage 4 days after discontinuation of Argatroban and following therapy with urokinase and oral anticoagulation. DIC = disseminated intravascular coagulation. Table 4 gives an overview of the most frequently observed non-hemorrhagic events sorted by decreasing frequency of occurrence (>/=2%) among Argatroban-treated HIT/HITTS patients. Adverse Events Reported in HIT/HITTS Patients Undergoing PCI: The following safety information is based on 91 patients initially treated with Argatroban and 21 patients subsequently re-exposed to Argatroban for a total of 112 PCIs with Argatroban anticoagulation. The adverse events reported in this section include all events regardless of relationship to treatment. Adverse events are separated into hemorrhagic (Table 5) and non-hemorrhagic (Table 6) events. Major bleeding was defined as bleeding that was overt and associated with a hemoglobin decrease >/=5 g/dL, that led to a transfusion of >/=2 units, or that was intracranial, retroperitoneal, or into a major prosthetic joint. The rate of major bleeding events and intracranial hemorrhage in the PCI trials was 1.8% and in the placebo arm of the EPILOG trial (placebo plus standard dose, weight-adjusted heparin) was 3.1%. **/* 91 patients who underwent 112 interventions. Table 6 gives an overview of the most frequently observed non-hemorrhagic events (>2%), sorted by decreasing frequency of occurrence among Argatroban-treated PCI patients. **/** Controls from EPIC (Evaluation of c7E3 Fab in the Prevention of Ischemic Complications), EPILOG (Evaluation in PTCA to Improve Long-Term Outcome with Abciximab GP IIb/IIIa Blockade Study) and CAPTURE (Chimeric 7E3 Antiplatelet Therapy in Unstable angina Refractory to standard treatment) trials. Source: ReoPro® Prescribing Information. § NR = not reported. There were 22 serious adverse events in 17 PCI patients (19.6% in 112 interventions). The types of events, which are listed regardless of relationship to treatment, are shown in Table 7. Table 7 lists the serious adverse events occurring in Argatroban-treated HIT/HITTS patients undergoing PCI. *Individual events may also have been reported elsewhere (see Table 5 and 6). **/* 91 patients underwent 112 procedures. Some patients may have experienced more than 1 event. Adverse Events Reported in Other Populations: Intracranial Bleeding: The overall frequency of intracranial bleeding among patients with acute myocardial infarction receiving both Argatroban and thrombolytic therapy (streptokinase or tissue plasminogen activator) was 1% (8 out of 810 patients). Intracranial bleeding was not observed in 317 subjects or patients who did not receive concomitant thrombolysis (see PRECAUTIONS , Drug Interactions ). Intracranial bleeding was also observed in a prospective, placebo-controlled study of Argatroban in patients who had onset of acute stroke within 12 hours of study entry. Symptomatic intracranial hemorrhage was reported in 5 of 117 patients (4.3%) who received Argatroban at 1.0 to 3.0 mcg/kg/min and in none of the 54 patients who received placebo. Asymptomatic intracranial hemorrhage occurred in 5 (4.3%) and 2 (3.7%) of the patients, respectively. Allergic Reactions: 156 allergic reactions or suspected allergic reactions were observed in 1,127 individuals who were treated with Argatroban in clinical pharmacology studies or for various clinical indications. About 95% (148/156) of these reactions occurred in patients who concomitantly received thrombolytic therapy (e.g., streptokinase) for acute myocardial infarction and/or contrast media for coronary angiography. *The CIOMS (Council for International Organization of Medical Sciences) III standard categories are used for classification of frequencies. Symptoms/Treatment: Excessive anticoagulation, with or without bleeding, may be controlled by discontinuing Argatroban or by decreasing the Argatroban infusion dosage (see WARNINGS ). In clinical studies at therapeutic levels, anticoagulation parameters generally return to baseline within 2 to 4 hours after discontinuation of the drug. Reversal of anticoagulant effect may take longer in patients with hepatic impairment. No specific antidote to Argatroban is available; if life-threatening bleeding occurs and excessive plasma levels of Argatroban are suspected, Argatroban should be discontinued immediately, aPTT and other coagulation tests should be determined. Symptomatic and supportive therapy should be provided to the patient (see WARNINGS ). When Argatroban was administered as continuous infusion (2 mcg/kg/min) prior to and during a 4-hour hemodialysis session, approximately 20% of Argatroban was cleared through dialysis. Single intravenous doses of Argatroban at 200, 124, 150, and 200 mg/kg were lethal to mice, rats, rabbits, and dogs, respectively. The symptoms of acute toxicity were loss of righting reflex, tremors, clonic convulsions, paralysis of hind limbs, and coma. Each 2.5-mL vial contains 250 mg of Argatroban; and, as supplied, is a concentrated drug (100 mg/mL), which must be diluted 100-fold prior to infusion. Argatroban should not be mixed with other drugs prior to dilution in a suitable intravenous fluid. Preparation for Intravenous Administration: Argatroban should be diluted in 0.9% Sodium Chloride Injection, 5% Dextrose Injection, or Lactated Ringer's Injection to a final concentration of 1 mg/mL. The contents of each 2.5-mL vial should be diluted 100-fold by mixing with 250 mL of diluent. Use 250 mg (2.5 mL) per 250 mL of diluent or 500 mg (5 mL) per 500 mL of diluent. The constituted solution must be mixed by repeated inversion of the diluent bag for 1 minute. Upon preparation, the solution may show slight but brief haziness due to the formation of microprecipitates that rapidly dissolve upon mixing. The pH of the intravenous solution prepared as recommended is 3.2 to 7.5. Heparin-Induced Thrombocytopenia (HIT/HITTS): Initial Dosage: Before administering Argatroban, discontinue heparin therapy and obtain a baseline aPTT. The recommended initial dose of Argatroban for adult patients without hepatic impairment is 2 mcg/kg/min, administered as a continuous infusion (see Table 8). Monitoring Therapy: In general, therapy with Argatroban is monitored using the aPTT. Tests of anticoagulant effects (including the aPTT) typically attain steady-state levels within 1 to 3 hours following initiation of Argatroban. Dose adjustment may be required to attain the target aPTT. Check the aPTT 2 hours after initiation of therapy to confirm that the patient has attained the desired therapeutic range. Dosage Adjustment: After the initial dose of Argatroban, the dose can be adjusted as clinically indicated (not to exceed 10 mcg/kg/min), until the steady-state aPTT is 1.5 to 3 times the initial baseline value (not to exceed 100 seconds) (see CLINICAL STUDIES for mean values of aPTT obtained after initial doses of Argatroban). Percutaneous Coronary Interventions (PCI) in HIT/HITTS Patients: Initial Dosage: An infusion of Argatroban should be started at 25 mcg/kg/min and a bolus of 350 mcg/kg administered via a large bore intravenous (IV) line over 3 to 5 minutes (see Table 9). Activated clotting time (ACT) should be checked 5 to 10 minutes after the bolus dose is completed. The procedure may proceed if the ACT is greater than 300 seconds. Dosage Adjustment: If the ACT is less than 300 seconds, an additional IV bolus dose of 150 mcg/kg should be administered, the infusion dose increased to 30 mcg/kg/min, and the ACT checked 5 to 10 minutes later (see Table 9). If the ACT is greater than 450 seconds, the infusion rate should be decreased to 15 mcg/kg/min, and the ACT checked 5 to 10 minutes later (see Table 9). Once a therapeutic ACT (between 300 and 450 seconds) has been achieved, this infusion dose should be continued for the duration of the procedure. * Initial IV bolus dose of 350 mcg/kg should be administered. **/* Additional IV bolus dose of 150 mcg/kg should be administered if ACT <300 seconds. In case of dissection, impending abrupt closure, thrombus formation during the procedure, or inability to achieve or maintain an ACT over 300 seconds, additional bolus doses of 150 mcg/kg may be administered and the infusion dose increased to 40 mcg/kg/min. The ACT should be checked after each additional bolus or change in the rate of infusion. Monitoring therapy: Therapy with Argatroban is monitored using ACT. ACTs should be obtained before dosing, 5 to 10 minutes after bolus dosing and after change in the infusion rate, and at the end of the PCI procedure. Additional ACTs should be drawn about every 20 to 30 minutes during a prolonged procedure. Continued Anticoagulation after PCI: If a patient requires anticoagulation after the procedure, Argatroban may be continued, but at a lower infusion dose [see DOSAGE AND ADMINISTRATION , Heparin-Induced Thrombocytopenia (HIT/HITTS) ]. Dosing in Special Populations: Hepatic Impairment: For patients with heparin-induced thrombocytopenia with hepatic impairment, the initial dose of Argatroban should be reduced. For patients with moderate hepatic impairment, an initial dose of 0.5 mcg/kg/min is recommended, based on the approximate 4-fold decrease in Argatroban clearance relative to those with normal hepatic function. The aPTT should be monitored closely, and the dosage should be adjusted as clinically indicated (see PRECAUTIONS ). Hepatic Impairment in HIT/HITTS Patients Undergoing PCI: For hepatically impaired HIT/HITTS patients undergoing PCI, refer to PRECAUTIONS , Hepatic Impairment . Renal Impairment: No dosage adjustment is necessary in patients with renal impairment (see SPECIAL POPULATIONS, Renal Impairment). Initiating Oral Anticoagulant Therapy: Once the decision is made to initiate oral anticoagulant therapy, recognize the potential for combined effects on INR with co-administration of Argatroban and warfarin. A loading dose of warfarin should not be used. Initiate therapy using the expected daily dose of warfarin. To avoid prothrombotic effects and to ensure continuous anticoagulation when initiating warfarin, it is suggested that Argatroban and warfarin therapy be overlapped. There are insufficient data available to recommend the duration of the overlap. Co-Administration of Warfarin and Argatroban at Doses Up to 2 mcg/kg/min: Use of Argatroban with warfarin results in prolongation of INR beyond that produced by warfarin alone. To avoid prothrombotic effects and to ensure continuous anticoagulation when initiating warfarin, it is suggested that warfarin be co-administered before discontinuing Argatroban. There are insufficient data available to recommend the duration of the co-administration. The previously established relationship between INR and bleeding risk is altered. The combination of Argatroban and warfarin does not cause further reduction in the vitamin K-dependent factor Xa activity than that which is seen with warfarin alone. The relationship between INR obtained on combined therapy and INR obtained on warfarin alone is dependent on both the dose of Argatroban and the thromboplastin reagent used. The INR value on warfarin alone (INR w ) can be calculated from the INR value on combination Argatroban and warfarin therapy (see CLINICAL PHARMACOLOGY , Figure 2 explanation and PRECAUTIONS , Drug Interactions ). 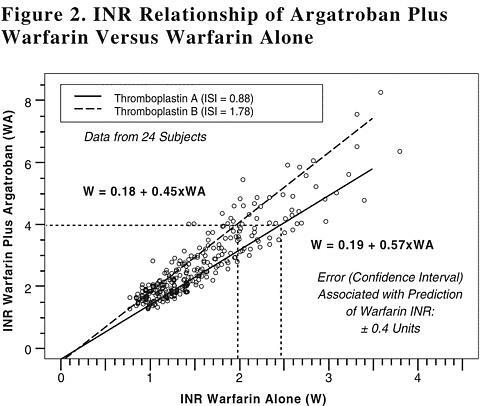 INR should be measured daily while Argatroban and warfarin are co-administered. In general, with doses of Argatroban up to 2 mcg/kg/min, Argatroban can be discontinued when the INR is >4 on combined therapy. After Argatroban is discontinued, repeat the INR measurement in 4 to 6 hours. If the repeat INR is below the desired therapeutic range, resume the infusion of Argatroban and repeat the procedure daily until the desired therapeutic range on warfarin alone is reached. Co-Administration of Warfarin and Argatroban at Doses Greater than 2 mcg/kg/min: For doses greater than 2 mcg/kg/min, the relationship of INR between warfarin alone to the INR on warfarin plus Argatroban is less predictable. In this case, in order to predict the INR on warfarin alone, temporarily reduce the dose of Argatroban to a dose of 2 mcg/kg/min. Repeat the INR on Argatroban and warfarin 4 to 6 hours after reduction of the Argatroban dose and follow the process outlined above for administering Argatroban at doses up to 2 mcg/kg/min. Argatroban is a clear, colorless to pale yellow, slightly viscous solution. If the solution is cloudy, or if an insoluble precipitate is noted, the vial should be discarded. Solutions prepared as recommended are stable at 25°C (77°F), with excursions permitted to 15° to 30°C (59° to 86°F) in ambient indoor light for 24 hours; therefore, light-resistant measures such as foil protection for intravenous lines are unnecessary. Solutions are physically and chemically stable for up to 96 hours when protected from light and stored at controlled room temperature, 20° to 25°C (68° to 77°F) (see USP), or at refrigerated conditions, 5° ± 3°C (41° ± 5°F). Prepared solutions should not be exposed to direct sunlight. No significant potency losses have been noted following simulated delivery of the solution through intravenous tubing. Argatroban Injection is supplied in 2.5-mL solution in single-use vials at the concentration of 100 mg/mL. Each vial contains 250 mg of Argatroban. Storage: Store the vials in original cartons at room temperature [25°C (77°F), with excursions permitted to 15° to 30°C (59° to 86°F)]. Do not freeze. Retain in the original carton to protect from light.